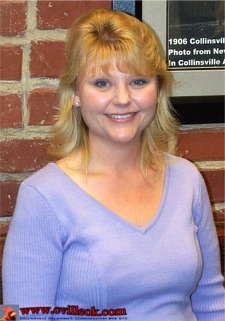 The Collinsville City Commission met Monday, Mar. 19th (at the City Hall Community Room, 106 N 12th Street) for a 7pm regular meeting of the City Commission and Municipal Authority. A. Approval of minutes of the Collinsville Municipal Authority Regular Meeting of March 5, 2007. Channel 6 TV coverage on both the Broadway Bridge and S-Curve aired March 18th and early March 19th. 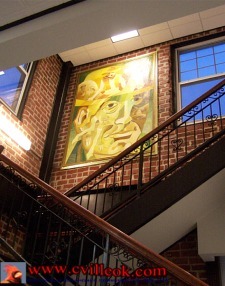 One of the two Woodruff paintings has been hung in the City Hall stairwell. The other will be hung after curtains arrive to prevent sun damage to the painting. Collinsville Downtown Inc. received word today that 4 Collinsville projects were top-3 state Main Street finalist. Final winners will be announced at the 18th Annual Oklahoma Main Street Awards Banquet, Tuesday, April 24th in OKC at the National Cowboy and Western Heritage Museum. City Clerk Kelly Young was attending training today at OSU. A. Approval of minutes of the March 5, 2007 Regular meeting. C. Approval of supplemental appropriation of $5000.00 from the Cherokee Nation for the Police Department. D. Cemetery Deeds: Sandy Bryant (2 spaces), Judy Willis (1 space), Cynthia Anderson (2 spaces). E. Approval of supplemental appropriation of $2000.00 from the Cherokee Nation for the EMS Department. 5. Continued discussion on a request to the City Commission by Collinsville residents to accept deeds of dedication for public roadway easements for a segment of 145th E. Ave. -- City Attorney Ken Underwood's review of agreements from earlier lawsuits related to this matter indicated everything appeared in order for item 4 below. A followup to the prior commission meet. 7. 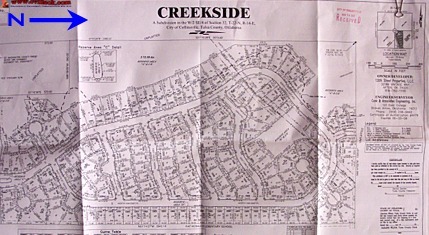 Creekside Subdivision Final Plat- Review and possible approval of a 180 RS-3 lots on 75 acres in Section 32, Township 22 North, Range 14 East located ¼ west of 129th East Ave on the north side of 126th St N. -- Approved -- This subdivision is located west of Herald Elementary and the new ECC. John Mayes is the developer. 9. Appointment of Ward II Planning Commissioner to a 3 Year Term from December 2006 through December 2009. Position was vacated by Lee Ann Lawrence on 11/06/07. -- Kathy Bradley was nominated and approved to fill this position (see photo above left). 10. Discussion and possible action on Ordinance 798. An Ordinance relating to the health and sanitation generally, Part 8, Chapter 1 of the code of city ordinances of the City of Collinsville, Oklahoma, amending Section 8-104, receipt of report, hearing and notice providing for severability, repealing all ordinances in conflict therewith and declaring an emergency and effective date. -- Approved. The time to allow city abatement of nuisances such as tall grass and trash was shorten to match state statutes: 20 days. The formal posting can also be at the property instead of waiting for newspaper publication. Kathy Bradley will represent Ward II on the planning commission. One of the on-loan Diane Woodruff paintings is now hanging in City Hall.